It should come as no spurise that there are more than 30 property developments currently taking place or waiting for approval in Phuket alone. These range from hotels to apartments and luxury villas. Buying in Phuket in years to come would come at a very high premium as the costs are always rising with the availability of land becoming an issue. There are currently about 37 projects in the pipeline for this year alone. Who said that Phuket would go as flat as Spain? 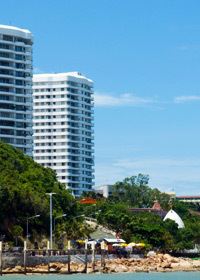 Surin Estate Condominiums (157 rooms) at Surin beach. From the listed projects it is clear that most of them are very large developmental projects. The question reamins only how high property prices in Phuket will go at the current rate of increase.